Love the finish of the frame, brushed nickel. The frosted glass is a favorite with customers and myself. The only problem is packaging seems to be inadequate, I have had several close calls with damage from ordering DREAMLINE products. I have been lucky and most of the time the product was still useable. This time the frame was damaged in an obvious spot, and would show in the finished shower. Overall I am very pleased with the quality of the shower doors. 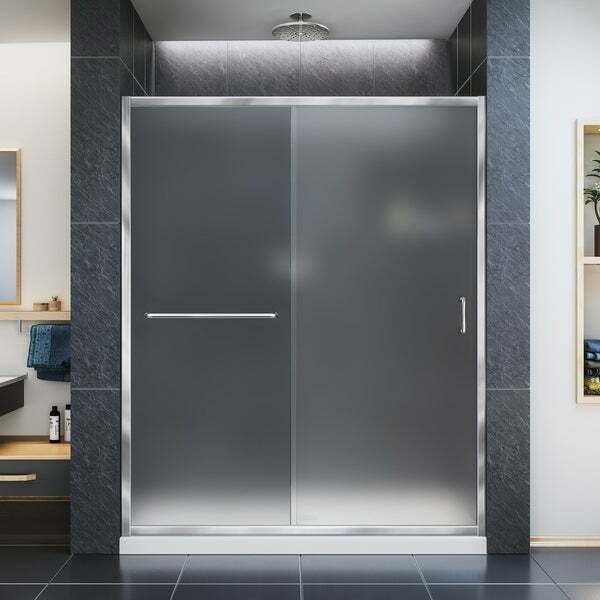 The DreamLine Infinity-Z sliding shower or tub door offers classic style with a modern touch. The Infinity-Z will transform your bathroom with a beautiful balance of functionality, elegance and sophistication. A variety of finishes and glass options will match any bathroom décor. Choose the DreamLine Infinity-Z model for the ultimate solution to your shower project. Walk-in Opening: 21 3/8 - 25 3/8 in. Dimensions 1.0 In. X 60.0 In. X 72.0 In. I've used DreamLine enclosures before and have been very pleased with their quality and value. This is my first purchase of the product from Overstock. Package was so severely beat up that I figured there there was no way it would not be broken, but it appears to be whole (have't installed yet). Not necessarily Overstock's fault, of course. What is bothersome is that this appears to be a returned item, as the components do not seem to be in their original wrapping and some pieces are taped up oddly. The entire box is taped up oddly, as if it has been opened, but that could have been done by the shipping company after mutilating the box. This should have been sold as an open box item not at full retail, if this is the case. I will add more after I've installed it and have a better idea of the condition and completeness of the item. sturdy construction and easy to install. A big problem with the actual opaque finish on glass vs. the picture. It is much denser looking---to my way of thinking, it looks institutional rather than slightly shadowed like it is pictured. the result is that it looks dense and even closes off light into the shower area. I buy and upgrade homes about every two years. I would not ever buy this door again. This was a difficult door to find. After it was installed, it made my new shower. Very well made! Everything arrived intact and quickly. Took my husband and his friend very little time to install it. "Is this door set clear or obscured glass? The description says clear, but the picture shows obscured. Thanks." Is it obscured, as in the picture. This particular item is the Dreamline Infinty-Z in frosted glass. It does mention in the details that the glass is ANSI certified frosted tempered glass and I also see where it says clear, so I see where your confusion is. But rest assured this is the frosted version of the Dreamline Infinity-Z. "I have a 54.5in opening. Is this door can be modified to fit it?" Hello Fixitall, we do apologize, this item is not able to be modified. Please feel free to contact us again with any further questions. Thank you for shopping with us!